Believing in Yourself is Your Magic! Little Witch Academia is an anime that came out of Studio Trigger after the release of two popular OVA’s. Announced during the airing of Space Patrol Luluco (I recommend that by the way) back in Spring 2016, I was pretty excited for a full series. The OVA’s were very fun and the world of witches seemed inviting. Did the TV anime manage to woo me with its magic and positive messages or was it a disappointment? Read on to find out! First let’s start with a little background on the OVA’s. The very first one was only 26 minutes in length and titled Little Witch Academia. It came out of the 2012 Young Animator Training Project, something that had been initiated by the Japanese government in 2010. Other titles were not met with as much acclaim as Little Witch Academia, especially not internationally. With an overwhelming amount of success from this first project, Trigger started a Kickstarter up in order to fund a sequel. This ended up doing very well, exceeding the funding goal requirements. In 2015 the sequel, Little Witch Academia: The Enchanted Parade, spearheaded by director You Yoshinari, was released. While not quite as positively received as the first entry by fans, nonetheless, people were clamoring for a full length television anime featuring the lovable young witches Akko, Lotte, and Sucy. This is where the story begins for me. I had held off on watching either title, despite them being on Netflix, until the conclusion of Space Patrol Luluco which formally announced the TV anime of Little Witch everybody had been waiting for. I figured I should at least check it out. Of the two OVA’s, the first one was definitely weaker for me. While it does introduce the aspiration that Akko has to become like her idol Shiny Chariot, it never really managed to capture me outside of its opening moments. This isn’t really the OVA’s fault, I mean it is a short after all, but it did suffer from not having enough time to fully explore its ideas. Naturally, I watched the second OVA which was longer at 53 minutes, and enjoyed things a lot more. This time there was more room for exploring the ideas that the first OVA had set out to do. I also found this one to be a lot more enjoyable. It was like watching a solid episode of a slice-of-life show with a bit of magical whimsy thrown in. There was humor and some drama too. Not perfect mind you, but it got me really looking forward to the Netflix release of the TV anime. Finally, in 2017 the TV version of Little Witch finally came out! However… the release outside of Japan was a jumbled mess. The first half of the series came out as expected but Netflix withheld the second half of the series for whatever reason (despite the whole production already being finished and available elsewhere) until sometime later in the year (forgive me, I can’t recall exactly when or for how long). While reception was rather positive for the first half, a lot of the excitement and buzz died soon after. With the flashy appeal of seasonal anime and the ever dwindling amount of free time for watching anime people had, it wasn’t surprising that people weren’t coming back to Little Witch. I had decided to hold off altogether until everything was available, but still had a hard time getting around to watching this. It was back on my radar once the “L” round of Anime ABC’s came around, and it just so happened to win so I had to watch it. If it weren’t for that, I might have just missed the ship entirely. This isn’t because I didn’t want to watch it, but in 2017 I too got caught up in the seasonal bug to some degree. It was hard to find the extra time between University, my job, the site, and later finding new work. Sometimes you just need to watch stuff that isn’t coming out right now. Doesn’t matter what it is really, but mixing the old with the new is never a bad idea. So with that, I can finally begin to express my thoughts on Little Witch and if it was worth the wait. When watching the very first episode I actually thought I was watching the OVA’s. It had been nearly a year since I had seen them but everything felt hauntingly familiar. A sort of déjà vu. The only thing that gave away the fact that I wasn’t watching the OVA’s was the considerably upgraded animation. It was what I had been expecting. There were some minor changes from the OVA’s in the cast’s composition. All of the characters are still there but you are primarily going to see a lot of Akko, Sucy, Diana, and Lotte. Girls like Jasminka are relegated to the supporting cast. You’ll still see them but not always as much. There is an exception to this in Amanda and Professor Ursula in particular. It may be a bit jarring if you’ve seen the OVA’s, I know it confused me a bit, so it is something to keep in mind before watching. While the initial episodes were pretty great, I had a lot of problems with the shows. Despite enjoying things at the start, I couldn’t help but feel irked by glaring issues. On top of that, a feeling of boredom started to creep in. With that let’s walk through all my grievances with this show one by one. Akko is the kind of character I don’t want to see fail, her dream is totally worth pursuing and something I can support. The problem lies in her character. When we first meet Akko she is energetic, outgoing, and bad at magic. Well, really, she’s kind of bad at everything. While it is true that we get to see her working hard at mastering spells in the early episodes, she also is always looking for shortcuts. When she isn’t doing that, she is acting on impulse and usually messing things up for others. This makes Akko a pretty unlikable protagonist. I never out right felt like I just wanted to see her fail but I wasn’t cheering for her success either. If anything, I was pretty indifferent to her. That’s a huge problem for Little Witch since the show clearly wants you to in her corner. Perhaps the biggest sin in Akko’s character is best seen with the introduction of Diana Cavendish, Akko’s foil. Diana is the best at magic, very responsible, and most importantly, extraordinarily hardworking. For the first half of the show, she’s painted as the villain though. As the series progresses, Akko learns about Diana’s history but still treats her like a bad guy. There is a whole episode where a magic mirror changes Akko’s appearance so she looks like Diana. She gets to see how she lives and supposedly “learns to respect” how hard Diana works. However, by the end of the episode, Akko doesn’t learn anything. They end up giving Diana three different character episodes and it isn’t really until the third one where Akko finally ends up acknowledging how Diana has earned everything she has. At the end of the day, I cared more about literally every other character more than Akko. She’s got a great character design, her voice actress does a great job, but her character is so abundantly flawed that I just couldn’t back her. I love that she’s striving for this great goal and the ultimate messages that the show delivers through her, I just wish I could like her character too. If Akko were the only problem with the show, I wouldn’t be nearly as annoyed with the experience as I am. The narrative is also riddled with problems. The most immediately obvious is the amount of exposition dumping and McGuffin plot convenience nonsense that Little Witch relies heavily on. Didn’t you know about all of this complex witch history? Oh I can’t believe you don’t know about this aspect of witch culture! How could you forget that some spells work one way and others another? Nearly every episode is like this and it is just ridiculous. It’s one thing to dump some of this exposition in once in order to get the plot moving but for almost the entire runtime is just absurd. The episode where the stone that powers the school suddenly has an energy limit. Sometimes you can use magic outside of school, other times you can’t (there is an attempt to explain this but it never really followed its own established logic). You’ve been a fish once, so now you can talk to fish because the episode requires it. Some of these examples are a bit nit-picky and were just the examples that sprang to mind after a few weeks of not having seen it, but stuff like this happened constantly. You may notice that a lot of what I described above have to do with the magic system. It has no rules, it works however the episode needs things to work. The example that comes to mind is actually pretty early in when Akko is having a hard time with ridding a broom. She can’t. Diana’s Mean Girls squad show up and cast a spell with verbal components to put training wheels and childish bits on the broom. It is supposed to be funny, and it is, but this demonstrates an issue the show has in that its internal logic is pretty inconsistent when it comes to the magic system here. What I had expected out of the Little Witch anime was a slice-of-life show with positive messages that expanded on what the OVA’s did. For the first couple of episodes I got this. While it wasn’t necessarily that great, it was delivering on what I expected. This pretty quickly gets thrown out the window though. Little Witch tries to throw in twists and turns in order to keep the show fresh and interesting. The thing is though, everything in this show is so straight forward and obvious. Even when it gets ridiculous in the final act, everything plays out exactly as expected. Let’s run through a few examples though. Perhaps the most relevant one is who Chariot is. I had pegged this episode one, it was that obvious. The anime likes to think that this is a pretty big mystery that has eons of build up. When you finally get the reveal, the show meanders about because “Chariot” just won’t talk to Akko. Actually, this is a HUGE problem with the whole story. Chariot causes literally all of the problems. She doesn’t tell Akko critically important information because…? Later it is assumed to be because she feels guilty about something she accidently did to Akko when she was a kid but nothing in the last act would have occurred had people just communicated with each other. Speaking of, the last act is absurd. A new teacher shows up about half way through and she seems amazing. Teaching magic in a modern context with technology (apparently a super bad taboo but the school hired her anyway). Guess who the bad guy is? The second she was on screen it was that obvious. That only adds to how predictable, and consequently, how boring Little Witch is. Despite having some fun and creative episodes (of which I haven’t spoken of yet but we will get to), the fact that I called literally every aspect of the show long before anything happened really hurt it. Remember, this isn’t the only problem so it just becomes a compounding issue. This brings me to my next point though. Trigger seems to really like to reference Gainax projects when they can. I don’t blame them given their history. Usually it is pretty fun! However, Little Witch becomes Gurren Lagann at some point. 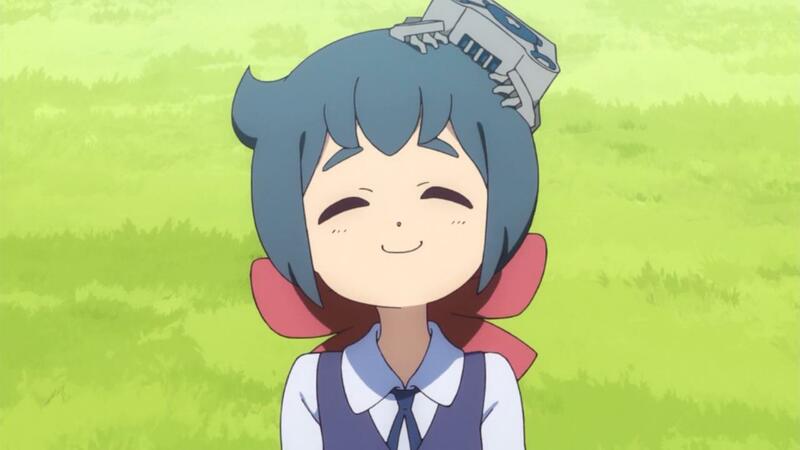 There is an episode all about Akko helping Constanze (the unequivocal best girl) with some event. This episode pays homage to TTGL and is kind of fun. That isn’t what I mean. I’m referring to the ridiculousness. 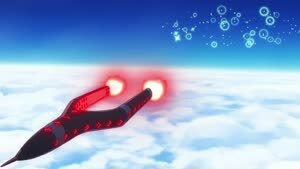 That works well in Gurren Lagann but not here. What was a show about becoming your own person and self-betterment, becomes about international politics and war. For some reason, politics are greatly impacted by soccer matches and the new baddy decides to invent some technology that is powered by negative human emotion. So of course she makes things worse on purpose. This leads to an actual war to nearly break out. In the final act, this magic poses a missile and launches itself at the “other country.” This is all in the efforts to encourage a full scale nuclear war to maximize human suffering so this magical entity can become stronger. I mean, this isn’t tossing galaxies around but it is so far removed from what the show sets out to do at the start that I couldn’t help but roll my eyes. There is absolutely no way to take this seriously and is a massive betrayal for what you the viewer are promised when starting the show up. To be fair, you still do get some of what you are promised when you first start. However, the show warps so far beyond anything that even makes sense that the main goal of the series becomes completely lost. Little Witch consumes itself by placing so much weight on this political intrigue plot that everything else becomes secondary. It isn’t a means to an end, it just overshadows everything else instead. I’ve been tiptoeing around this particular topic because it is pretty baffling. Little Witch has a lot of messages, most of which are positive but there was one that felt super out of place: technology/progress is evil. You get glimpses of this pretty early when everybody proclaims that magic serves no purpose in this world anymore. Science rules the day apparently. This statement literally makes no sense. Countless times you see how magic can do numerous things that science simply cannot. 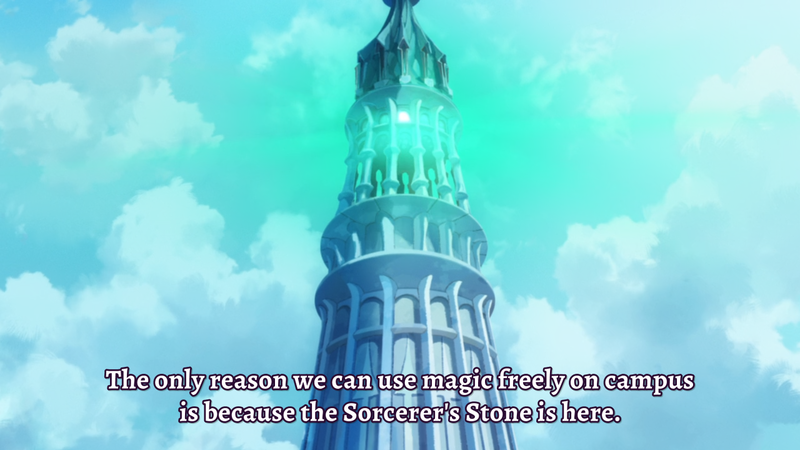 On top of this, Luna Nova is very adamantly against technology and everything is fueled by magic and tradition. Akko comes and bucks the trend when it comes to the tradition department and it kind of seems like the anime suggests that traditional magic and science could work together. This idea is enhanced when Croix is introduced. However, the reason the missile incident even occurs is due to the marriage of magic and science that disregards tradition. It’s a weird message. Ultimately tradition (aka magic) wins the day. Science is clearly the bad guy here. Now I know the ultimate message is that by believing in yourself, and with the help of others, you can change the world but it comes with a caveat. You can only make a positive difference by observing tradition and not relying on modern conveniences granted by technology. I’m not sure this was even intentional, but by the end it is so anti-progress in what it portrays that it really feels like it was. Since I was watching The Ancient Magus’ Bride while watching this, I couldn’t help but notice how shoddy Little Witch was in comparison. The two shows share a lot of similar messages, explore magic in a modern context, while offering a sense of magical whimsy with a great cast (overall). The difference is that Magus’ Bride does a better job. This is mostly due to the fact that Magus’ Bride is more focused. It takes its time to properly explain things and explore its world. The characters are often more interesting and well put together as well. In addition to this, Chise is a likeable protagonist who I want to root for. Even though this show is still ongoing (at the time of writing at least) it has done more for me than Little Witch could have even dreamt to. This isn’t to say that Magus’ Bride is perfect. It isn’t. However, since I was able to compare these two shows I couldn’t help but realize that Little Witch just couldn’t deliver what I wanted. Everything I expected from Little Witch was offered in Magus’ Bride and it was almost always done better there. At the end of the day, I feel like I wasted my time with Little Witch which is a real shame since it should have been something I enjoyed quite a lot. What are your thoughts on Little Witch? Let me know in the comments below. This article is dedicated to Sam C. who is a long-time Patreon supporter of mine. Consider joining him and showing your support for the site as well. For full details, just click the button below. Thanks for reading and I hope to see you back here at Jon Spencer Reviews again soon! Nice review! 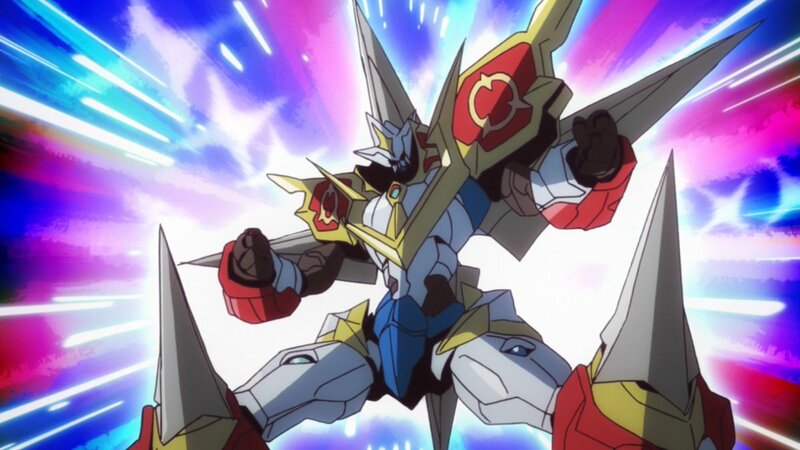 It looks like I’m less likely to watch it now but you reminded me that gurren lagan exists and I should probably finally get around to finishing that. I put it on hold because there was a lot of battles and fights I just didn’t care for but I heard it changes later so it might be worth going back to! I remember that about little witch, it’s release schedule was so strange! All of the anime youtubers weren’t watching it because it’s not legal yet meanwhile I was just thinking who cares how you watch it? Also how does this voting thing work? And how do you get people to vote? I’ve done a few polls before but not really got a many people responding. Netflix releases stuff weird, that’s what was going on here. Huge delays between each half. Voting occurs typically within one week of the completion of the current ABC article. When I put the poll up I do it via Qualtrics survey and include all the anime I own, want to watch, or am aware of (granted I have access) for the current letter. People generally share this pretty hard as its a favorite for many. Usually get astound 20 to 30 votes but I’m bigger now so probably trend upwards some. Yeah I’m glad you reminded me of that! I get that, so if I was to something like that in the future I’d try to hype it up and encourage sharing, thanks a lot! I see, you’re hyping your up as well! I get it, I am going away on holiday soon to a place where I won’t be able to use the internet so hopefully I’ll get to vote before going! Pinning is a good idea, never would have thought of that! Oh yeah, I really love this series! Each article I try and take a totally different approach so they are wildly different from each other while still maintaining a certain consistency. Feel free to check the others out sometime. As to voting, that’ll remain open for a full week once I put it up so hopefully you’ll have the few minutes it takes to participate 🙂 Pinning things is a very useful tool, I use it a lot! That’s interesting and actually a really good idea! If you change your style you might just find something that works great and stick with it! Yeah I should be able too have time, just hope I don’t forget! I had a couple friends who were trying to get me to watch this one quite a while back… It’s still on my to watch lost. Lol! Needless to say, I’m still not sure if I’m rushing to watch it with so many other things to get to! I couldn’t get past episode 15. I like the episodic adventures stories int he first half, but it all felt bad and completely wrong during it’s second half for me. Same, it was bearable in the first half but past that it just got really sloppy. Still lots of problems in that first half but the show was way more watchable overall. I’ve been watching this one almost purely for the enjoyment of the animation at this point. I do agree that the characters and plot can get a little wonky. 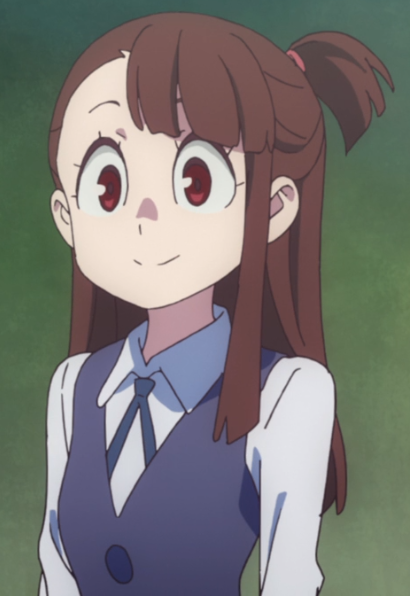 Akko also definitely seems like they took a typical shounen main character and made her female (ie. Naruto, Fairy Tail, etc). Somehow I enjoyed the first OVA more than the second. Contrary to your experience, I found the first to be just the right length as more would’ve broken the breakneck pace everything was happening. Well, I watched it not expecting anything but the animation and that’s precisely what I got. The second OVA tried to expand the world, and that was a welcome addition but I feel that drama and characterization weren’t able to live up to the high standards the animation created. In my mind anime is better if it knows it can only be good visually and it doesn’t attempt (and therefore doesn’t fail) to be better than it can. About Akko, I agree with you to some degree, but even if she’s a pretty shallow and easily definable girl, she still is the heart of the show – none of the adventures would’ve happened if Akko hadn’t been there and hadn’t failed at everything. 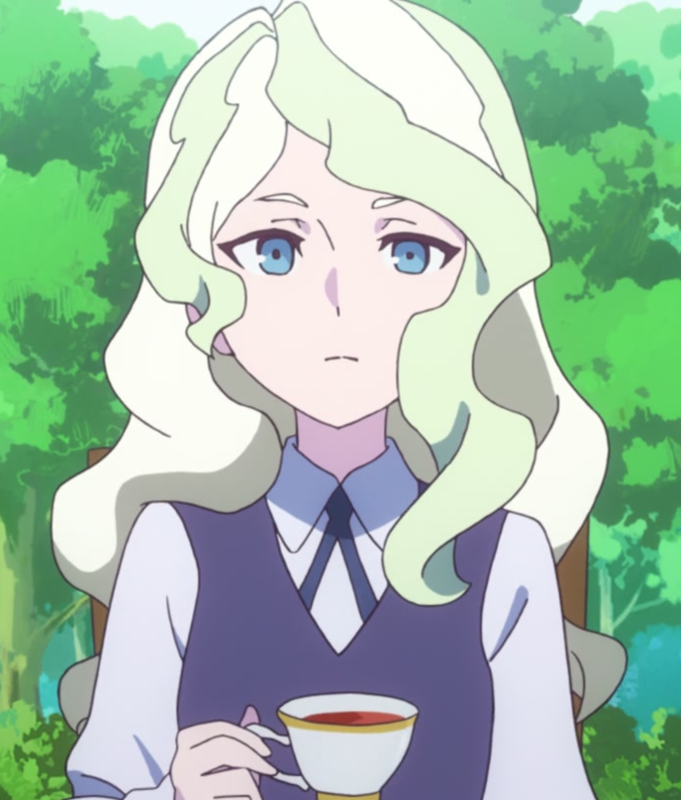 Without her LWA would’ve been a far more boring show. About everything else, I pretty much agree – the storytelling really is a mess. Well, maybe I can conjure a weak argument that it’s Trigger and Trigger kind of does what it wants regardless of the viewers but mecha still clearly should have no place here. There’s also that intended metaphor that Akko symbolizes a young animator coming to the business, but even if it spices things up, it’s still often not enough. I guess LWA left me with a bit better impression than you just because I expected that the story won’t be anything to wright home about. Maybe if LWA was only 12 episodes or so, the story would’ve been more condensed and with less opportunities to stray away on meaningless tangents. P.S. Sorry for wasting quite a lot of space. Totally fine on the space. My thoughts on the OVA’s are atypical. As to the rest, even with that it doesn’t change my thoughts. 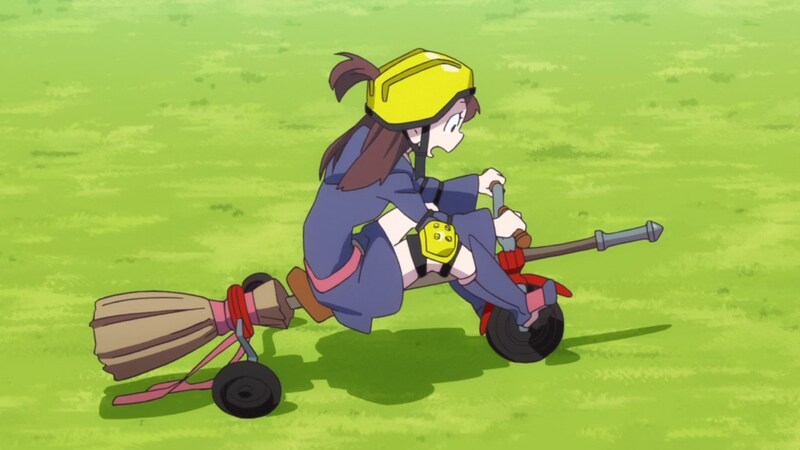 I get that Akko drives the show but it’s how she drives it that is the problem. I haven’t seen this and I wasn’t sure if I should put it on my Netflix queue, but I may pass on it. The fact that the main character is unlikable is a huge turn off. If you can’t rot for the main character(s), then why bother watching? That’s my philosophy on that matter. Good job on the review though! Thanks man. I’m with ya, if the main character is hard to root for then there needs to be things that make up for it. There really isn’t here. Some stand out moments but that doesn’t make a show. You’re welcome. I’m glad you feel the same way. Unlikable characters and/or Protagonist Centered Morality can really hinder a show for me. I still haven’t watched this one though I have access to it at this point. Mostly because descriptions of the main character always make it seem like I won’t much like her, and I haven’t heard enough good things about the story itself to tip me into actually starting it. I will watch it eventually, but I’m not rushing for this one. Thanks for sharing your thoughts on the series. I can’t really blame you. If the main character doesn’t sound like somebody you can connect with than I think that sinks the whole show for you. There are so many flaws and to have a constant reminder on screen at all times is just obnoxious. Like I said, there were good moments but too few and far between.